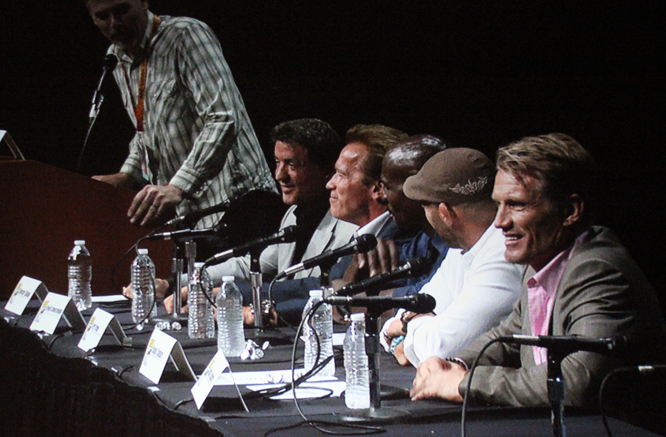 The panel for The Expendables 2 opened with Sylvester Stallone, who hit the stage with the audience chanting “Rocky”. It’s fitting for Stallone, who made a great impact with his first visit to Comic-Con a couple of years ago. After he settled, a film reel played showcasing his film career. Afterward the moderator asked Stallone his opinion on the reel — he replied that all he can think is “Ouch, ouch, ouch”. Stallone talked about action heroes evolving in film. In the 80s action stars were musclebound, very physical, and spouted one-liners. Nowadays they’re more technical and lean towards a sci-fi approach. Regardless, Stallone believes both versions are valid in their own right and that it will continue to evolve. 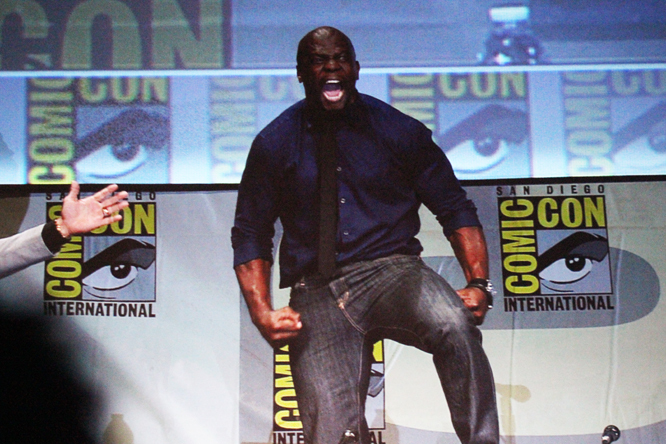 Terry Crews, Randy Couture and Dolph Lundgren joined Stallone on stage, but before the panel really kicked off, the moderator mentioned there was an empty seat. The lights dimmed and another film reel began; this time it featured Arnold Schwarzenegger. Afterward, the man himself made his way out to a thunderous applause. As you can imagine, the crowd erupted with laughter. Crews paused for a moment, realized Schwarzenegger complimented his bodybuilding, and excitedly exclaimed, “I can die now! Arnold loves my muscles! I can die now!” Schwarzenegger responded with, “I hope you don’t take it the wrong way,” but it was clearly too late — he was blushing. So Schwarzenegger did the natural thing and placed his hand on Crews’ cheek to feel his blush. It was a beautiful and tender moment. Randy Couture — rather than being a jokester — was completely sincere when he spoke, and discussed how he wants to further his acting career, and working on the film was a huge step in the right direction. Stallone went on to discuss that he receives injuries in films that are successful and jokingly hopes he gets beheaded in the next one. Upon being asked on each other’s favorite films . . . of each other, Stallone jokingly said his is Junior, then gave his serious answer: Terminator 2. Schwarzenegger on the otherhand became sentimental and expressed his love for the Rocky and Rambo franchises and mentioned how he’d love to see more being made, all while Stallone softly said, “No,” with a smile. Stallone’s reaction made something click in Schwarzenegger’s head and he went off on a tangent about a skill that Stallone has that most of us wouldn’t know about: he’s a painter. Stallone suddenly looked embarassed while Schwarzenegger gushed about his artwork. Stallone’s embarassment only made him more giddy and proudly told Hall H that Stallone has given him a painting for his birthday. He didn’t want to be too mean on the guy and admitted that he has painted too for his own family. I felt that was a very profound tidbit of information to leave you with. The Expendables 2 punches theaters August 17.